In-school programs are designed to use object-based learning or drama-based methodologies to support existing curriculum, as well as to supplement ENL learning, enhance visual literacy and critical thinking skills, and build awareness around bullying. Through programs like Drama Literacy, Project Hero, Word Up!, and ArtLink, Guild Hall offers original K-12 programs led by trained artists within the schools of Eastern Suffolk County. Guild Hall, in collaboration with Hamptons International Film Festival, offers this experience-based program for understanding theatre that also provides a safe forum to discuss real life situations, such as bullying. The issue of bullying is a key concern for students of all ages, and teachers have specifically requested an arts-based program that deals with this increasingly troubling issue. Project Hero aims to empower students with the ability to explore all sides of the issue through theatre and film, addressing the special needs of the students and the entire community in the areas of conflict resolution, social and community integration, and appreciation of the arts and social studies. 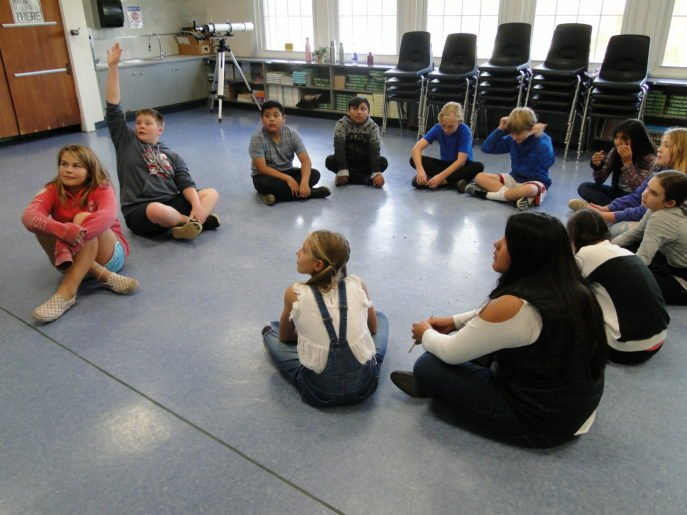 This 15-session program, currently offered to 5th graders at the Montauk School, assigns a professional actor/writer/ educator to work in-residence in each classroom to develop students’ reading and language arts skills through interactive learning techniques that involves acting out words and stories. Students learn to work cooperatively and engage one another creatively as they try to interpret a story and then adapt it to a theatrical script. By interpreting stories through creative role playing and tableau techniques, students develop empathy for others with different points of view. Working within the English curriculum and the NewYork State Learning Standards for the Arts, the Education Department of Guild Hall implemented this program in conjunction with the Montauk School and the East Hampton Middle School. Professional poets lead students in creating, revising and presenting their own original works of poetry. Students learn various techniques of verbal expression while expanding their understanding of the art of spoken language and oral traditions. The poetry workshops culminate in a live poetry event on the stage of Guild Hall’s John Drew Theater, where students read original works, selected poems, memorized works, and fellow students’ poems. ARTLINK offers an opportunity for students to stretch their creativity beyond the classroom with hands-on visual art, music, science and literary activities. In the program, second-grade students travel to The Nature Conservancy, one of Guild Hall’s collaborative partners and steward of The Andy Warhol Visual Arts Preserve, to view their exhibition on display and tour the breathtaking site in the Montauk Moorlands. During their visit, students photograph the regional flora and fauna, while learning about the wildlife, growth and planting, local history, and photography. When students return to the classroom, local poet Scott Chaskey leads them in a series of poetry workshops, allowing the children to develop, create and share their observations about the wildlife, land and seascape that they experienced at The Preserve. In the final stage of the program, students visit Guild Hall, where they learn photographic enhancement techniques for adding texture and color to their Warhol Preserve prints. The resulting watercolor prints and the poems they wrote in the classroom are then displayed as part of Guild Hall’s Student Arts Festival. Colgate-Palmolive, Kate Cassidy Foundation, The Hearst Foundation, The Lewis B. Cullman Education Program in memory of his brother Joseph F Cullman III, Lorenzo and Mary Woodhouse Trust, The Melville Straus Family Endowment, and The Schaffner Family Foundation.